Posted by Stuart Herbert on October 18th, 2010 in Glamorganshire Canal, Modern, Radyr, River Taff, Single Shot Series, Taff Trail, Taff Vale Railway (Modern-day Valley Lines). 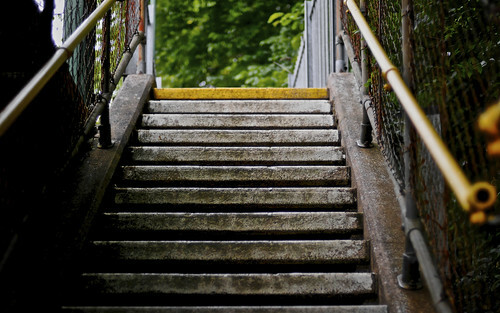 These are the steps up to Platform 1 of Radyr Railway Station, as seen from the end of the bridge that crosses the River Taff to the immediate east to join with the Taff Trail. Originally opened in 1863 as part of the Taff Vail Railway, Radyr Railway Station once sat at a busy railway junction and railway sidings (Radyr Yard). Today, the railway sidings are gone, and the station has been remodelled into three platforms serving trains travelling up from Cardiff Queen Street Railway Station via Cathays Railway Station on their way to Treherbert in the Rhondda, Aberdare in the Cynon Valley and Merthyr Tydfil in the Taff Valley (all via Pontypridd). The station is also the point where the railway south splits into two, with the City Line carrying passengers down via the longer Danescourt and Fairwater route into Cardiff Central. The car park is popular on a weekend with cyclists looking for access to the Taff Trail; the section from here down to Cardiff Bay is very flat and very leisurely, and takes in beautiful areas such as Radyr Weir and Bute Park. Posted by Stuart Herbert on September 20th, 2010 in Historical, Radyr, Single Shot Series. 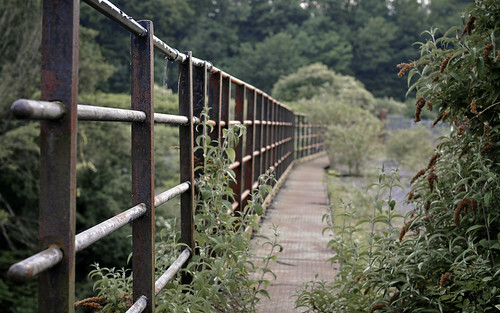 This bridge, clearly visible from the modern-day City Line south of Radyr Railway Station, used to carry trains across the River Taff, across Hailey Park upon an embankment, to link up with the main TVR line at Ty Mawr Bridge. This branch line was used to provide an alternative route into the railway sidings at Radyr Yard. Radyr Yard itself is gone (closed in 1993; replaced by a modern housing estate), the railway embankment through Hailey Park has been removed, and all that remains is the bridge itself, fenced off but still spanning the Taff, serving no obvious useful purpose any more.